... and with both Moody's and various restructuring bankers warning that the bond party is almost over, there is a distinct smell of corporate crisis in the air. But what if the first domino to fall in the coming corporate debt crisis is not in the US, but in China? After all, as part of China's aggressive deleveraging campaign, there has already been a spike of corporate bankruptcies as banks shed more of their massive note holdings and de-risk their balance sheets. According to Logan Wright, Hong Kong-based director at research firm Rhodium Group LLC, there have already been least 14 corporate bond defaults in China in 2018; a separate analysis by Economic Information Daily, as of May 25, there had already been no less than 20 corporate defaults, involving more than 17 billion yuan, a shockingly high number for a country which until recently had never seen a single corporate bankruptcy, and a number which is set to increase as Chinese banks pull pull back from lending to other firms that use the funds to buy bonds, exacerbating the pressure on the market. "You have seen banks redeeming funds placed with non-bank financial institutions that have reduced the pool of funds available for corporate bond investment overall," Wright told Bloomberg, adding that additional bond defaults are especially likely among those property developers and local-government financing vehicles which have relied on shadow banking sources of funds. 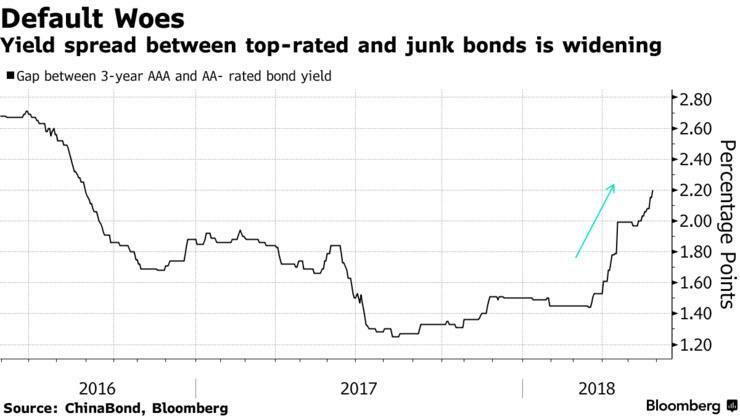 As we discussed last year, as part of Beijing's crackdown on China's $10 trillion shadow banking sector, strains have spread from high-yield trust products to corporate bonds as the lack of shadow funding has choked off refinancing for weaker borrowers. 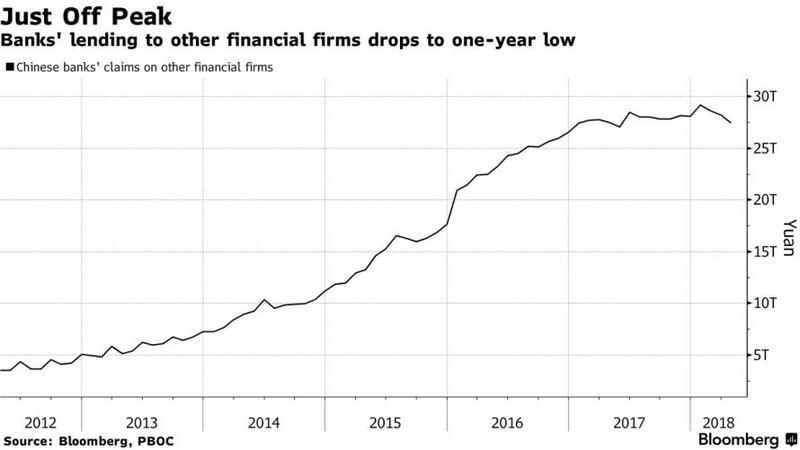 Separately, Banks’ lending to other financial firms, a common route for funds and securities brokers to add leverage for corporate bond investments, declined for three straight months, or a total of 1.7 trillion yuan ($265 billion), since January according to Bloomberg calculations. The deleveraging campaign is also depressing bond demand: “Unlike the U.S., where the majority of buyers of bonds are mutual funds, individuals and investment companies, in China, the key holders of bonds are bank on-and off-balance sheet positions,” said Jason Bedford, a Hong Kong-based analyst at UBS Group AG, who noted that Chinese banks are buying far fewer bonds as a result. Putting the number in context, according to Bloomberg, China’s four largest banks held about 4.1 trillion yuan in bonds issued by companies and other financial institutions at the end of 2017, nearly 20% below 5.1 trillion yuan a year earlier; all Chinese banks held about 12 trillion yuan of corporate bonds on or off their balances sheets, some 70% of outstanding issuance, according to Citic. 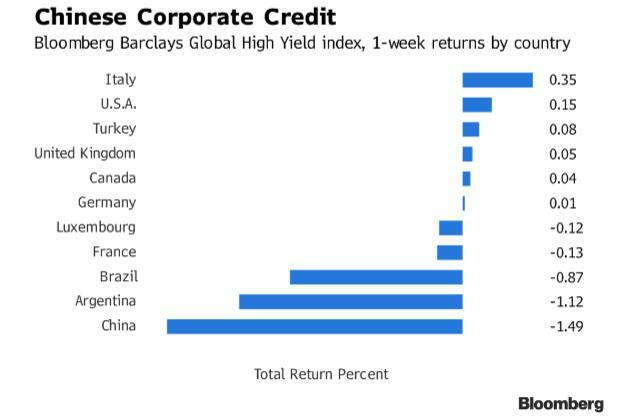 Today, Bloomberg's Sebastian Boyd points out that of all emerging markets, it is in China where the weekly Bloomberg Barclays global high yield index has seen the biggest drop (for the reasons why EM is getting crushed, read the lament by RBI governor Urjit Patel). Also worth noting: China is the biggest component by far in the various bond index aggregators, accounting for more than the next two countries, Brazil and Mexico, combined. The deterioration accelerated over the past week when state-owned China Energy Reserve & Chemicals Group defaulted last Monday, blaming tighter credit conditions, slamming the performance of both the energy sector and wireline companies. Furthermore, as Boyd writes, "Chinese electricity-company bonds in dollars have widened an average of 125bps in the past week, led by Huachen Energy Co., a unit of Wintime Energy, after the Shanghai stock exchange queried its liquidity." The recent blow out in Chinese corporate bond spooked none other than the PBOC, which last last Friday announced that it will accept lower-rated corporate bonds as collateral for a major liquidity management tool in a move that analysts see as designed in part to restore confidence in the country's corporate bond market. And while the PBOC intervention may delay the moment of reckoning for the world's most indebted corporate sector, it will not eliminate it. One potential catalyst: Chinese companies have to repay a total of 2.7 trillion yuan of bonds in the onshore and offshore market in the second half of this year, and together with another 3.3 trillion yuan of trust products set to mature in the second half, the funding problems will get worse. As already more than eight high-yield trust products have delayed payments so far this year. To be sure, Beijing will do everything in its power to avoid a default waterfall, but another emerging - pardon the pun - risk is that as Boyd concludes, negative sentiment towards Chinese corporates could become a major headwind for EM debt, even as the crises in Argentina, Brazil and Turkey appear to calm down, resulting in another significant capital outflow from Emerging Markets, and even more pained complaints from EM central bankers begging the Fed to halt its tightening, or else.